These Packs give you a very usable sheet size, varying from 8x10" to 8x12" (unless otherwise noted). Each pack saves you at least 25% off the regular price, and in many cases even more! Packs include regular stock items as well as unusual non-stock glass. We take care to ensure the best variety and quality! Illustrations are provided to give you an approximation of what may be in each pack. The glass in your package WILL be different from the assortments shown. 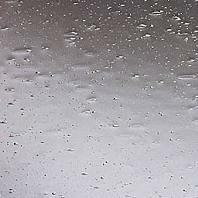 Without a doubt, Spectrum Clear Seedy (SP 100 SDY) is our very best selling glass in the entire shop. We have literally a TON of 8x12 sheets available and we are making them available in packs of 10 sheets. Regular Price is $60.00 for the ten, but while they last, we will offer these Ten Packs for just $39.97, a savings of over $20. Second best selling clear Spectrum is their clear Waterglass (SP 100 W). We have accumulated many 8x12 sheets since Spectrum has ceased production and we are able to offer them a substantial discount. Regular Price is $36.00 for six 8x12's, but while they last, we will offer these Waterglass Six Packs for just $26.97, a savings of over 25%. 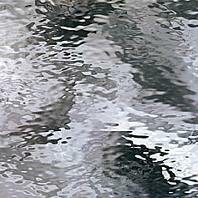 Spectrum's Clear Rough Rolled has a soft, indistinct texture that makes for a pretty obscure background. We have tons of 12x12's available and we are offering them at 30% off the regular price of $8.99 each. A $45.95 value is now 30% off. Just $31.47 for the pack of five. Spectrum's Granite texture is deeper and brighter than the Rough Rolled texture, above. Makes a bright and obscure background and we are offering them at 30% off the regular price of $8.99 each. 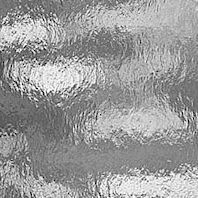 We've packed TEN sheets of sparkling clear glass in different textures. A great package for making snowflakes, or for backgrounds. 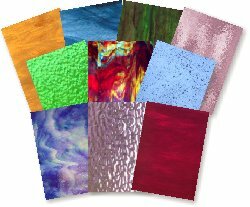 All different textures from Wissmach, Spectrum, Kokomo and others, with at least one sheet of iridized. 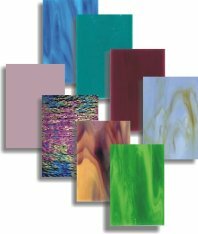 There are 13 different 8x10 sheets of fine Wissmach Glass including Pinks, Hots, plus at least one sheet each of Mystic and English Muffle. A great way to find out just how good Wissmach Glass is! We include 5 SHEETS of leafy and foliage green glass in this package. 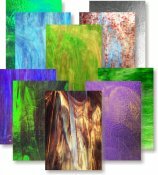 Includes opals, cathedrals, streakies in 8x10 to 8x12 sheets. An assortment of our best selling white opals, from dense to wispy. 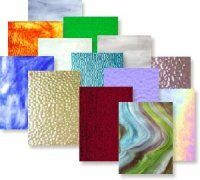 You get 12 assorted sheets (8x10 to 8x12) of white opals, including a sheet of iridized. May have a few duplicates, but you get the assortment you need at a price you’ll love. 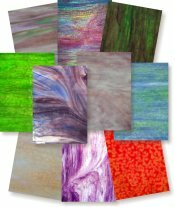 There are eight sheets, 8x10 to 8x12 of lovely spring floral colors. Yellow, pink, orange, green and blue for skies. Bright and fresh assortment. 6 sheets of Fall Foliage colors. May include brown mixes, green mixes, reds and oranges. All perfect for the fall season. There are 10 different colors of Mystic Glass in this pack. Includes a nice cross section of the 40+ newest colors from Wissmach. Cathedral Colors, Streakies and Wispy Opals with a light cat's paw texture are the trademarks of Wissmach's newest line. Over $55 value in this package of 8x10 sheets! 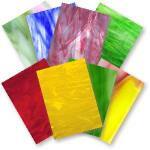 We include 13 SHEETS of cathedral glass in a wide assortment of colors. Includes hots plus at least one sheet of English Muffle Glass, Waterglass and Artique. 10 sheets of all different glass. Most colors are NON-STOCK and one of a kind items. Includes hots and iridized colors. ONE OF OUR MOST POPULAR SELECTIONS! 8 sheets of Kokomo Opalumes, Wissmach solid opals, solid opal mixes and other glasses especially suited for making mosaic projects. Will include at least one HOT or IRIDIZED sheet. 10 sheets of Wissmach's Victorian Mottle Glass. An excellent assortment to familiarize you with this wonderful Tiffany Style Glass. Perfect for Lamp and Window work. Includes a broad assortment of colors, including hots! Sheets are 8x10 to 8x12" in size. There's at least $50 worth of glass in this assortment! 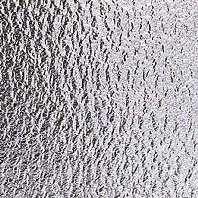 See our selection of System 96 Fusible Glass Packs. 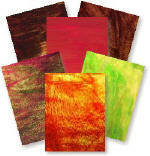 Choose from Opal Art, Spirit, Cathedral, Opal and other great assortments. If 90 COE Glass is more your thing, we have a selection of Glass Packs featuring COE 90 glass by Uroboros.